Before addressing the fifth principle—qi (life force)—which is the last of the five principles cited in my previous post about beauty in what some viewers may see as grotesque scholars’ stones, I wish to return to my cook’s view of my beautifully ugly dog named “Cat.” Following a sharp clip to the ear from Isabelle—affectionately named “the cook”—for dragging her unguarded and innocent utterances into my blog, I have been alerted about an interesting reference to beautiful ugliness in an unlikely source that Isabelle had been reading: Jane Austen’s novel, Pride and Prejudice. Occupied in observing Mr. Bingley's attentions to her sister, Elizabeth was far from suspecting that she was herself becoming an object of some interest in the eyes of his friend. Mr. Darcy had at first scarcely allowed her to be pretty; he had looked at her without admiration at the ball; and when they next met, he looked at her only to criticise. But no sooner had he made it clear to himself and his friends that she had hardly a good feature in her face, than he began to find it was rendered uncommonly intelligent by the beautiful expression of her dark eyes. To this discovery succeeded some others equally mortifying. Though he had detected with a critical eye more than one failure of perfect symmetry in her form, he was forced to acknowledge her figure to be light and pleasing; and in spite of his asserting that her manners were not those of the fashionable world, he was caught by their easy playfulness. The reason that I mention Mr Darcy’s conundrum in sensing instinctively that Elizabeth was beautiful, despite the assessment of his “critical eye” that Elizabeth had “more than one failure of perfect symmetry in form,” is to reiterate the idea that perceiving beauty may not always be a simple “tick-list” process of validation based on concepts of symmetry and ideal proportions. 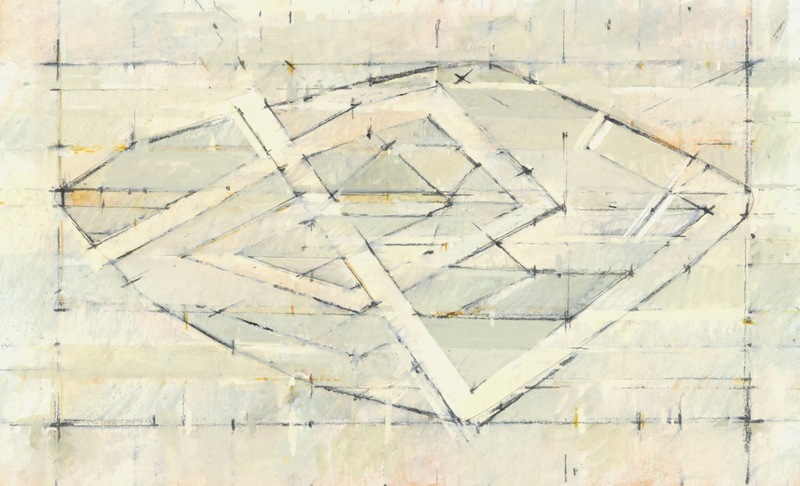 In short, seeing beauty in a subject that is allegedly not beautiful is driven by a different set of qualities—signifiers of an inner beauty, such as dynamic structure, rhythm and form. Going further, a viewer’s instinctive awareness of the presence of inner beauty in subjects that are superficially unattractive may be triggered by circumstances that bring this inner beauty to the surface. These “circumstances,” from an Oriental viewpoint, arise from effects of five principles: shou, zhou, lou, tou (discussed in the previous post) and qi (that I will explain in the following discussion). Let me begin by describing my perception of qi, or life-force. 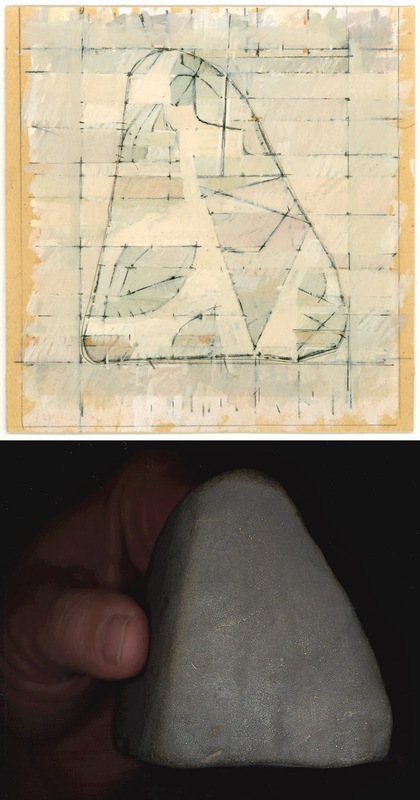 that I see in the scholars' stone shown below. 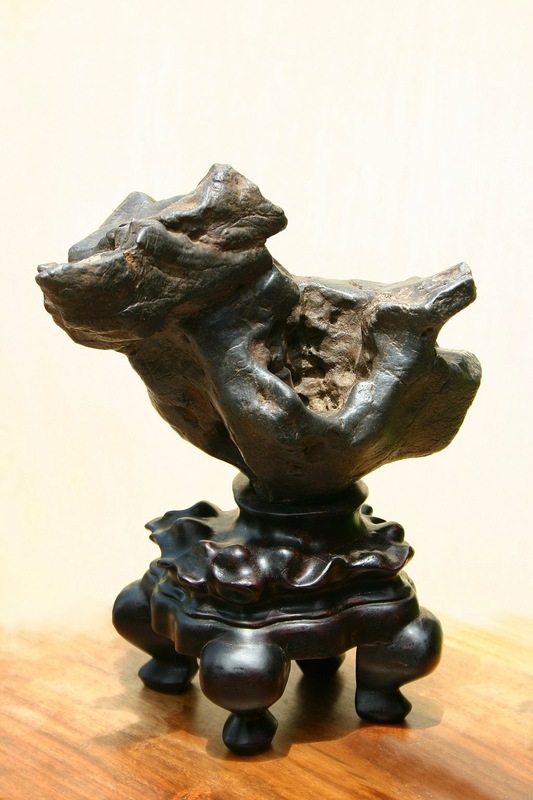 “Black Pearl” is a Chinese term for a highly prized and very hard rock from the Penglai Prefecture, Laibing Country, Guangxi Province, China. 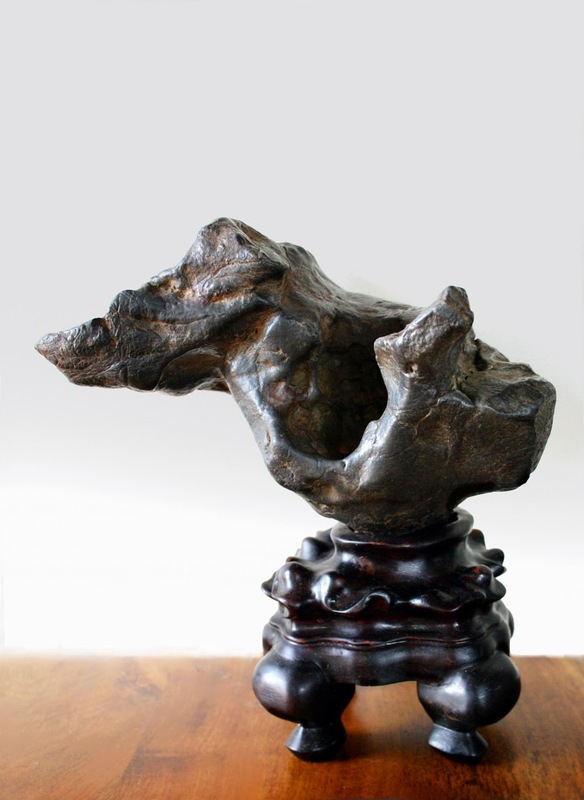 Its lustrous surface is created from natural water erosion as it is “too hard to be easily worked [by hand]” (see Hu Kemin 2006, Modern Chinese Scholars’ Rocks: A Guide for Collectors, Floating World Editions, Warren, p. 71). Condition: No chips or wear beyond the natural aged condition and patina of the stone. The hand-crafted and lacquered wooden base is faultless. I am selling this stone for a total cost (including shipping to anywhere in the world) of $980 AUD. Please contact me using the email link at the top of the page if you have any questions or click the “Buy Now” button below. 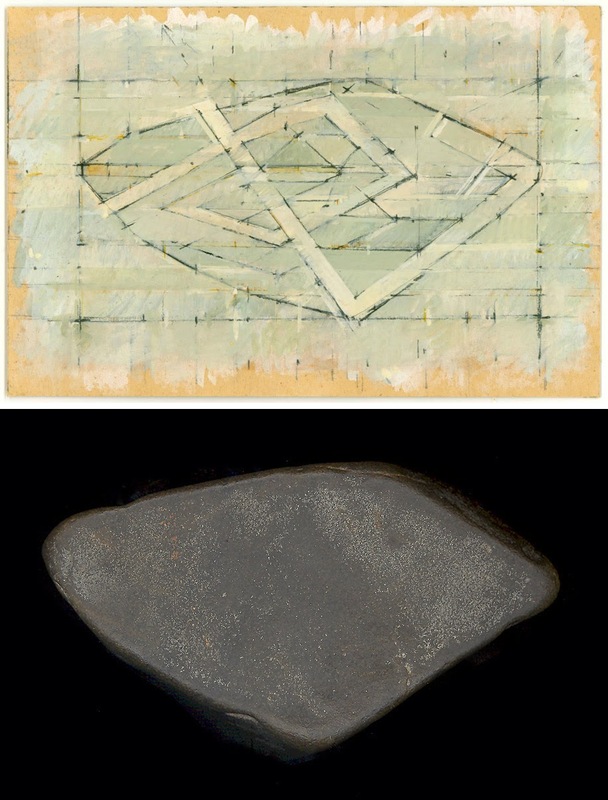 What I see and, importantly, what I feel, with regard to qi, is an arrestingly beautiful spiralling energy extending out of the central cavity of the stone while simultaneously drawing inward into the same cavity—an inward flow that even tunnels into the rock itself as shown in the last image above. 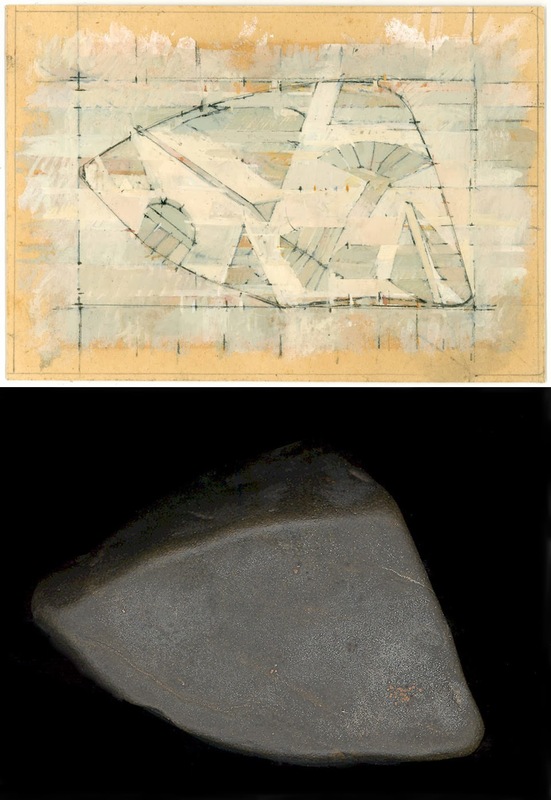 Again, based my response to this energy, the life-force attribute of qi in this stone is a non-visible but, nevertheless, almost palpable feeling of connection and interaction between the dynamic twisting structure of the stone and its surface of wrinkles (zhou) and hollows (lou). 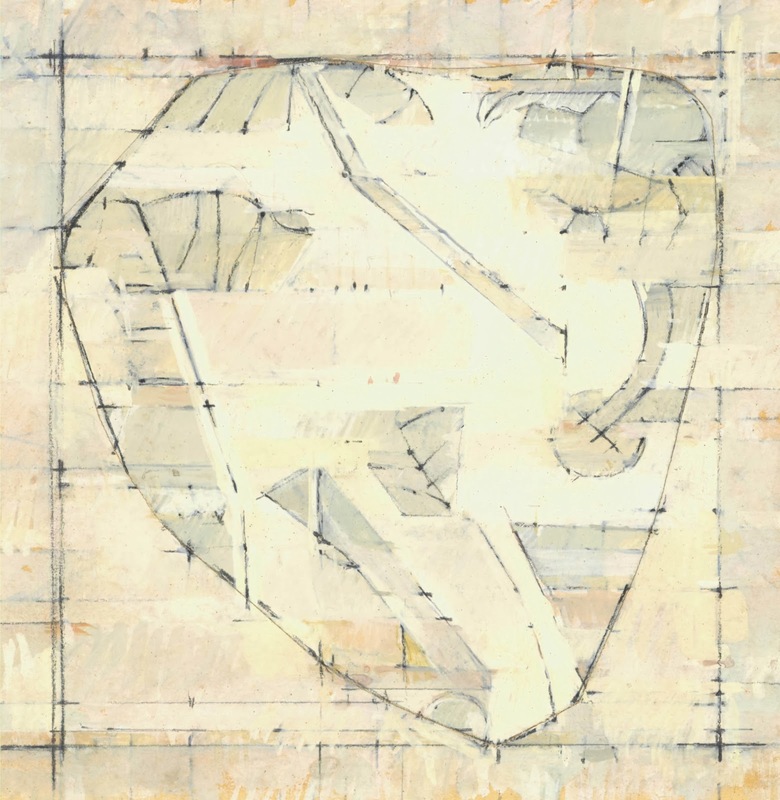 Or to express this slightly differently, the attribute of qi is manifest in the spirit of the stone’s inner rhythms reflected in its outer shell. 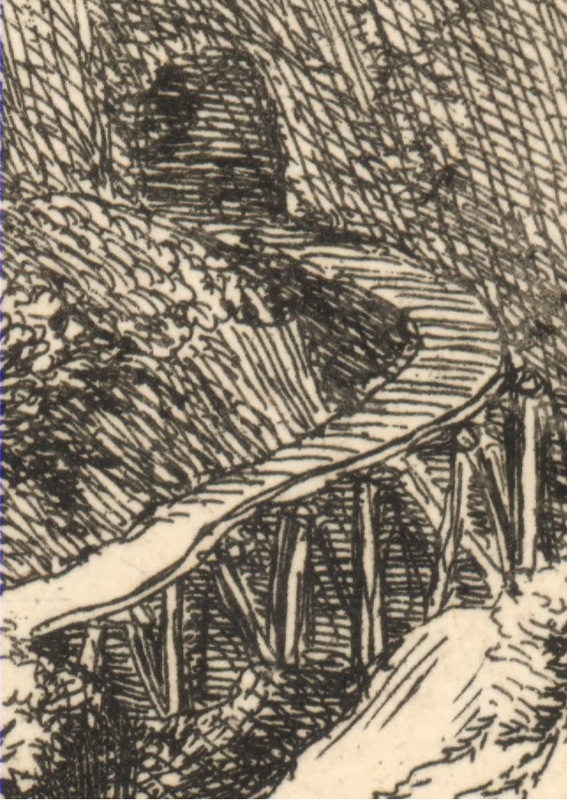 http://www.britishmuseum.org/research/collection_online/collection_object_details/collection_image_gallery.aspx?assetId=494337&objectId=3128466&partId=1 [viewed 10 February 2014) and Small Curved Wooden Bridge (shown below). 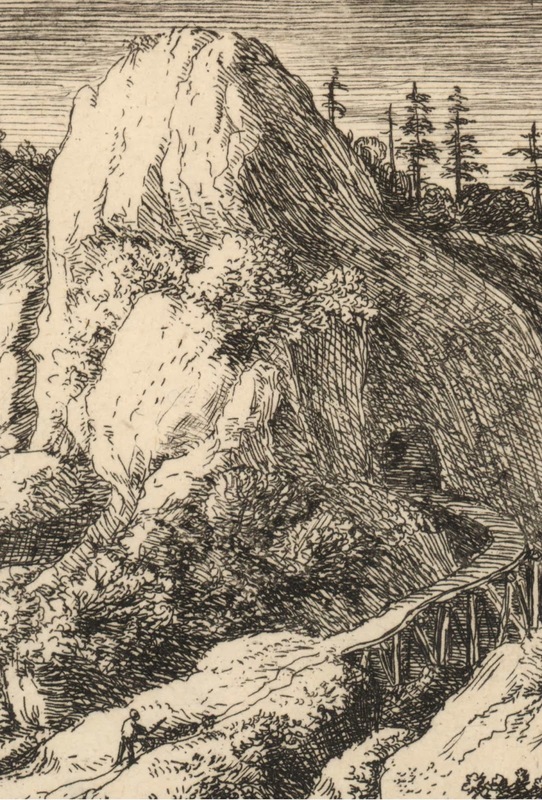 The latter print is particularly interesting to me as the featured bridge leads to a tunnel—perhaps a mine—cut into the side of a mountain: a very literal invitation to contemplate the mountain’s inner realm. 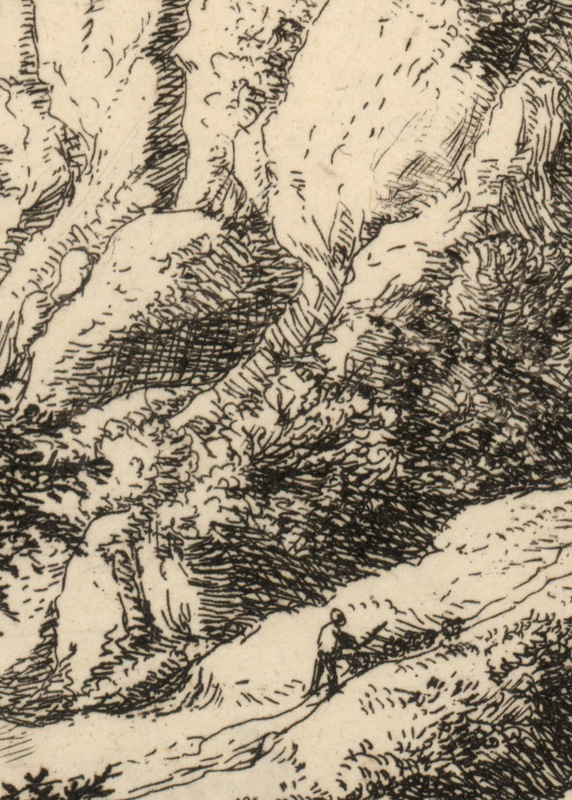 According to Bartsch regarding this state: “Heavy cross-hatching darkens the tunnel opening. 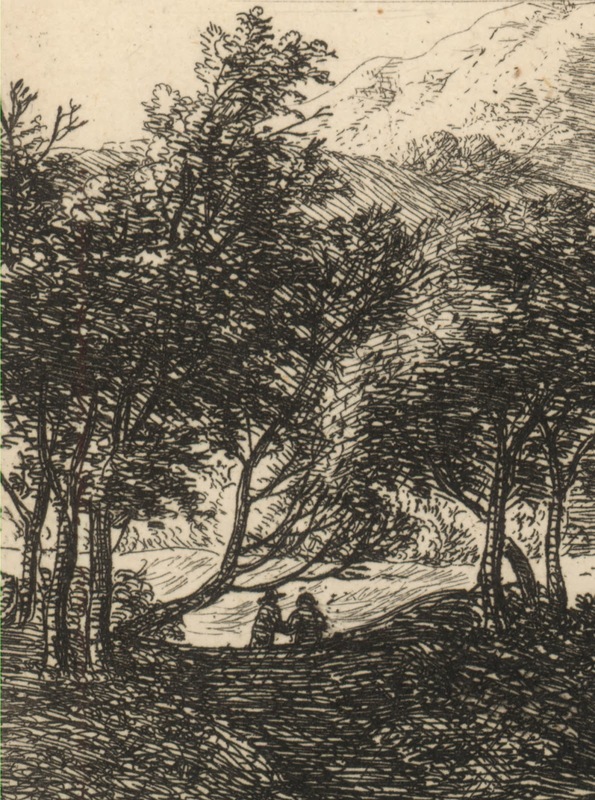 Additional cross-hatching in the bottom areas” (p. 13). Condition: The impression is cut on, or near to, the plate mark; some wear to the fine lines of the sky; a printer’s crease in the sky; otherwise a fine impression with collectors’ notations in pencil verso. I am selling this etching for a total cost (including shipping to anywhere in the world) of $157 AUD. Please contact me using the email link at the top of the page if you have any questions or click the “Buy Now” button below. Artists have also engaged with the feeling of a life-force that may be read on surface of a subject. 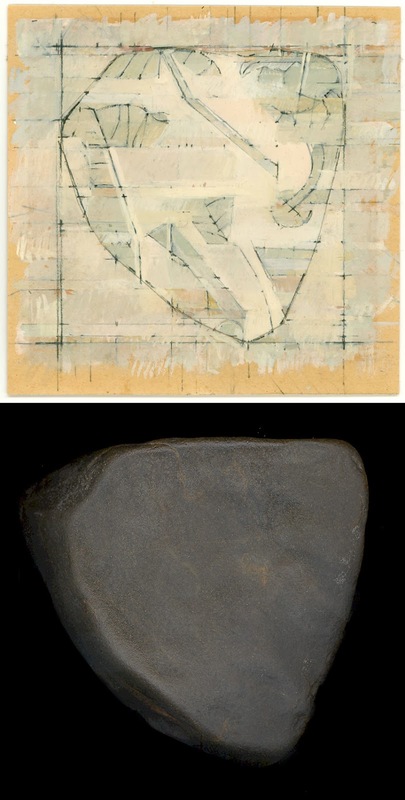 For example, Robert Preston’s (1942–) four gouache studies of a rock, Path Watcher (shown below) focus on surface patterns he perceives on different face-planes of a rock that commanded his attention. 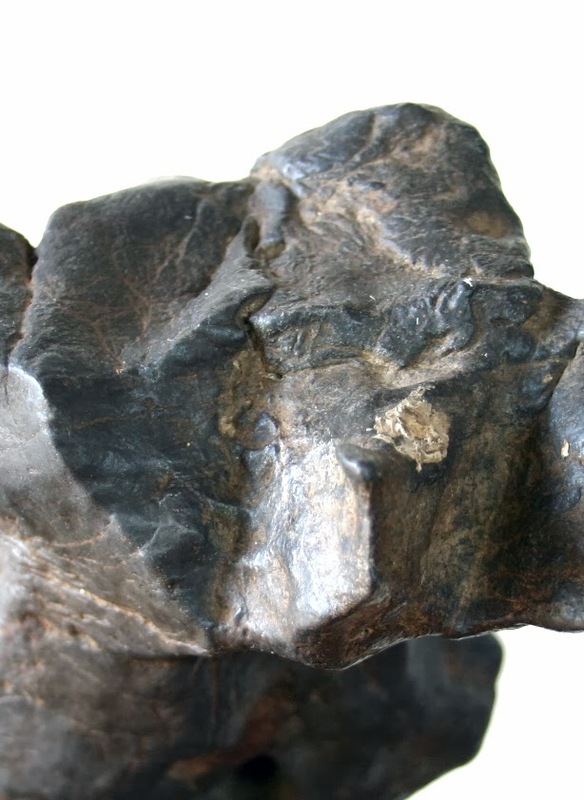 (I could be mistaken but I understand that this rock [also shown below] caused him to stumble and, as a consequence, he valued its power to influence the direction in which he was travelling). 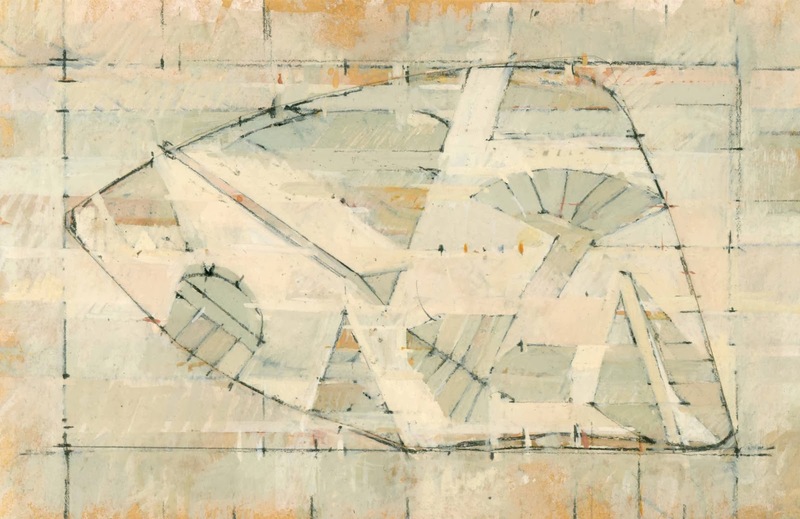 Here, the expressed beauty is not fundamentally about the form of the subject. 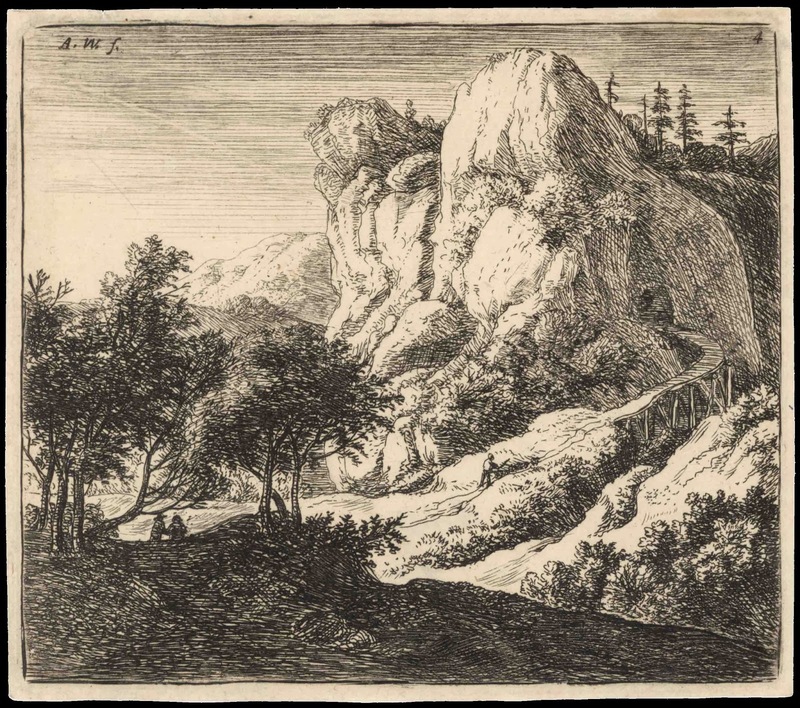 Rather, the beauty lies with the pattern of irregularities that are intrinsically a part of the rock examined: a rock that as Preston euphemistically describes as having “made itself known” to him. 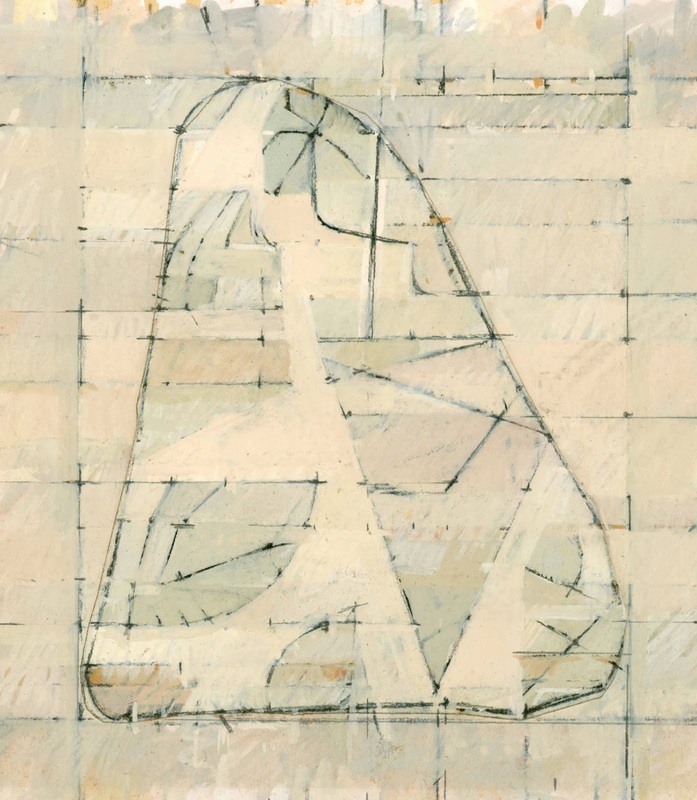 Condition: These paintings have been framed in the past and there are traces of the mounting tape on verso. I am selling this Path Watcher suite of four unframed gouache paintings, for a total cost (including shipping to anywhere in the world) of $600 AUD. Please contact me using the email link at the top of the page if you have any questions or click the “Buy Now” button below. 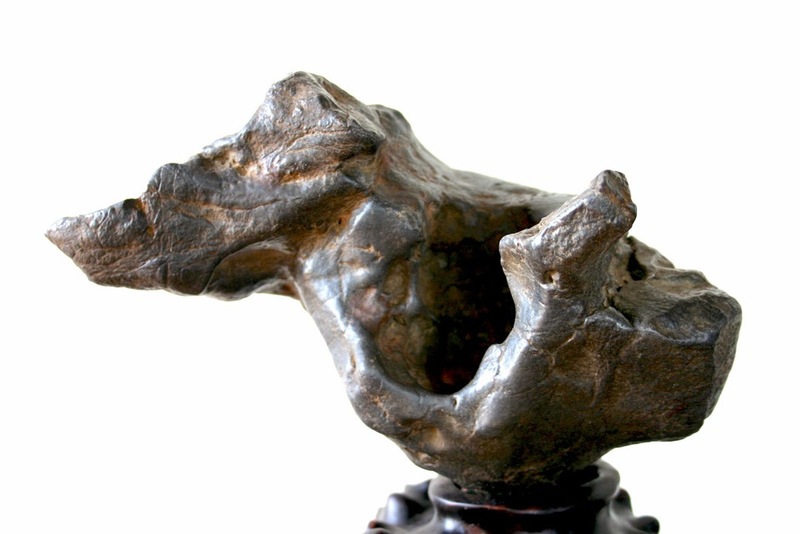 awkwardness (overhanging asymmetry)—an attribute that Kemin (2006) explains very well: “if the two ends of a markedly vertical scholars’ rocks are of different size, it is normally inverted, displayed with the larger end above the smaller end, a position known in China as yun tou, yu jiao, or ‘head of cloud, feet of rain’.” (Hu Kemin 2006, Modern Chinese Scholars’ Rocks: A Guide for Collectors. Floating World Editions, Warren, p. 112). 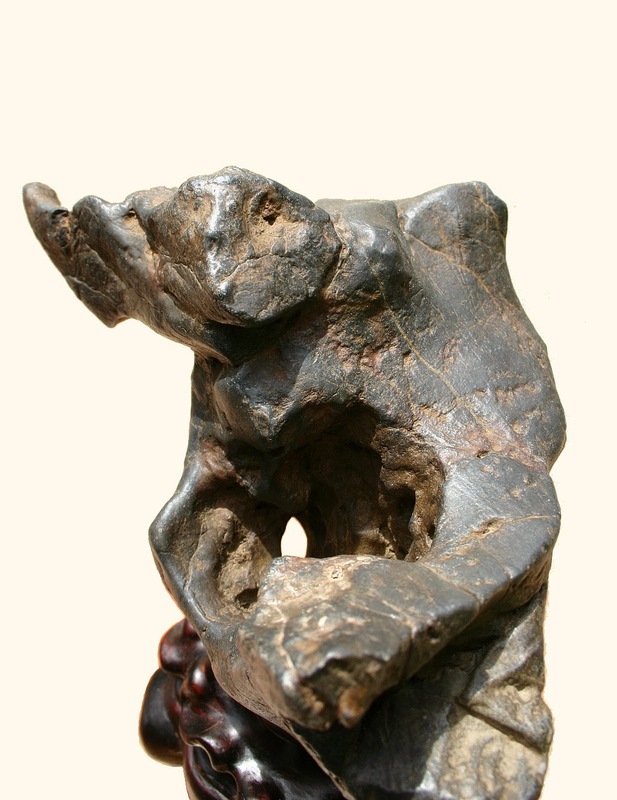 This attribute can be seen in the petrified wood discussed in the last post. moistness (glossy and tactile surface). read posts, but this website offers quality based writing.